I worry about the increasing use by ordinary people of psychological/psychiatric diagnostic labels. We think we know what we mean, but often there is a much deeper or even completely different meaning that we don’t know. For example, I’m hearing a lot of people throw around the term narcissist these days. Show any sign of selfishness–and who doesn’t?–and you’re a narcissist. Share a compliment that someone gave you with anyone else, you’re a narcissist. It’s really just a more sophisticated way of namecalling, an upgrade from words like jerk, moron, retard, and so on. In mythology, Narcissus is the most beautiful boy whom many have ever seen, but he does not return anyone’s affections. One of the disappointed nymphs prays to the god of anger,Nemesis, that “he who loves not others love himself.” Nemesis answers this prayer. 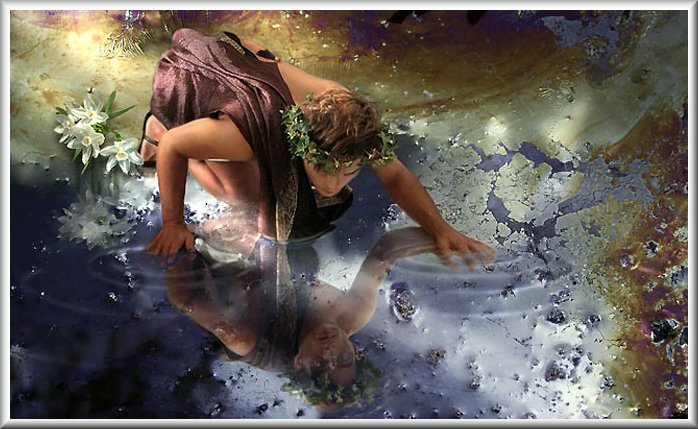 Narcissus looks at his own reflection in a river and suddenly falls in love with himself. He can think of nothing and no one else. He pines away, leaning perpetually over the pool, until finally he perishes. The story of Narcissus includes the story of Echo, a nymph who falls in love with him. Echo falls under an unfortunate spell cast by Hera, who has suspected that Zeus is interested in her or, at least, in one of her nymph friends. Hera determines that Echo will always have the last word but never have the power to speak first. That is, she only can repeat other people’s utterances. When the dying Narcissus calls “farewell” to his own image, Echo can only repeat the words—a final good-bye. In the place where Narcissus dies, a beautiful flower grows, and the nymphs call it Narcissus. So the basis of the narcissistic personality disorder is that the person is incapable of loving anyone but himself. He demands that everyone else in his life adore him as well, and he is very demanding. Definitely a taker, not a giver, because no one else is as important as he is. As the Bible says, we should not think more highly of ourselves than we ought to think (Romans 12:3). It gets us into a lot of trouble. It’s interesting to note that people who are pleasers, givers, and don’t think much of themselves are often captivated by the extremely charming narcissist. However, once the relationship is established, the pleaser realizes that his interest in her was only for his own self-aggrandizement. If being a people pleaser is deeply ingrained in your life, it can be hard to stop. Chances are pretty good that you grew up in a home where one or both parents were people pleasers; or, on the other hand, very demanding and insistent that everyone else please them. Either way, you developed a habit of always putting yourself aside in an attempt to keep everyone else happy. You can’t. It’s not your job. Last week, we looked at several ways to help you stop your people-pleasing behavior. Here are a few more. 1. Learn to say NO as if you mean it. Do not say, “I’m really sorry, I hope you won’t be offended, but I just don’t think I can. . . .” You will be easily bulldozed into doing it anyway. Instead, learn to say, “No, thank you. You’ll have to find someone else.” Say it with a smile, but a steely look in your eye. If the other person persists, smile again and say, “No.” No explanations are required. Just say no. It gets easier after that first one. Above all, do NOT apologize. It weakens your position. 3. Is it worth it to say no? Sometimes, you will say NO and lose a “friend.” Notice the quotes? They indicate that the person wasn’t much of a friend if she dumps you for saying NO to her. A true friend will understand that you are already over-extended, and will not be upset with you. 4. No excuses. No apologies. For every excuse you offer, the other person will have a bullet ready to shoot it down. And by the way, this same principle applies with your children. Sometimes, you just have to say NO and make it stick, without giving tons of reasons. Your children are just as capable of taking advantage of you as anyone else is. 6. Set reasonable, enforceable boundaries. I had to learn to do this many years ago with someone who was monopolizing my time with lengthy phone calls. She said she wanted to change, but she never did. The littany of woe was continual and unchanging. Finally, on someone’s wise advice, I set a boundary. I told this person that until she had performed a specific task that I described, she was not allowed to call me again. She never called me again, and that was that. Easy. 7. Don’t worry about fallout. It’s not the end of the world. So the person gossips against you? Don’t worry about it. This too shall pass. And it’s none of your business what others say about you. “But what if” needs to be removed from your vocabulary. Nothing good comes from that kind of thinking. The bottom lline is that you do not exist for the benefit of the users of this world. You have the autonomy and authority to choose where you will spend your time and energy. No one else gets to be the boss of you in this egard. Learning to say NO and make it stick is wonderfully freeing, and gives you a new sense of control over your life.